This unique teacher time-saver includes scores of helpful, practical lists that may be reproduced for classroom use or referred to in the development of instructional materials and lessons. The material contained in this book helps K-12 teachers reinforce and enhance the learning of grammar, vocabulary, pronunciation, and writing skills in ESL students of all ability levels. For easy use and quick access, the lists are printed in a format that can be photocopied as many times as required. A complete, thoroughly updated glossary at the end provides an indispensable guide to the specialized language of ESL instruction. Sixty all-new lists reflecting the latest information and resources for teaching English language learners, including additional lists on culture, holidays, geography, journaling, non-reversible pairs, tongue twisters, fluency practice, expanded health words and idioms, meeting and greeting new students in the classroom, and new list of related websites. A classic in the field: The ESL Teacher’s Book of Lists has been a classic in the Jossey-Bass Book of Lists series, filled with useful information for the pre-service student. Huge and growing market: The increase in the number of English language learners (ELLs) in our schools has been staggering. In the Southeastern U.S., the ELL population in K-12 schools grew by more than 400% from 2003 to 2004. Some estimate that by 2025, 25% of K-12 public school pupils will come from homes where a language other than English is primary. All pre-service students need to understand this constituency. Value-packed resource: Most ESL supplementary books have a single focus: conversations, grammar, verbs, etc., requiring educators to buy several books to meet the needs of their ESL students. 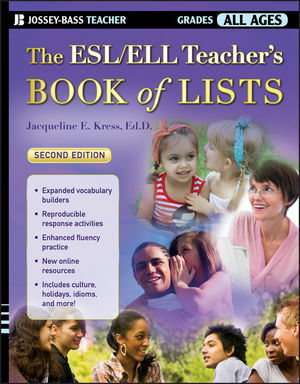 The ESL/ELL Teacher’s Book of Lists covers all these topics and more in one volume, for a reasonable price. Fully revised and updated: The second edition is completely updated, with more than 85% new material, including 60 all-new lists reflecting the latest information and resources for teaching English language learners.